When Sinclair Research finally threw in the towel in 1986 and surrendered its computer business to Alan Sugar's Amstrad, a number of projects were left uncompleted. As the Sinclair design team was disbanded, details of the projects inevitably leaked into the public domain. By far the most interesting was the so-called "Super Spectrum", codenamed Loki. Depending on which account one believes, the name either derived from the Norse god (renowned for his love of games) or as a derivative of the acronym for Low-cost Colour Computer, aka LowCCC or LC3. The Loki was intended to be an Amiga-beater, with custom graphics and sound chips, a "huge" 512x256 resolution in up to 256 colours and a 128K memory. The machine would also have a fully-buffered expansion bus, RGB, composite and TV display outputs, a serial port, two joystick ports, a light pen (supplied), three different types of MIDI port, stereo sound in and out, a headphone socket, and a video recorder/video disc interface. On top of all of that, floppy disk, hard disk, compact disk, mouse and modem connectivity would also be available. This remarkable package would cost as little as £200. All of this was, of course, completely unrealistic and the specification amounted to little more than a wish-list. At the time, the Amiga, which was in some respects more limited than the Loki specification, cost £1,500. Much of that cost was due to its sophisticated custom-designed hardware. The Loki would have cost millions to develop over a period of several years (the Amiga took four years) and a £200 price point was far too low if the developer expected to make any money back. In the event, the machine appears to have got no further than the design phase and was abandoned by Amstrad. Interestingly, however, its concepts did come to fruition in a very different form. After the Amstrad takeover, two ex-Sinclair engineers, John Mathieson and Martin Brennan, set up their own company called Flare, drawing on the Loki designs to produce a new multiprocessor games console. Atari were drawn into the project and, seeking to challenge the Sega Genesis/Megadrive and Super Nintendo, brought the machine to the market as the Atari Jaguar. According to Jaguar developer Andrew Whittaker, "Some of that [Loki] technology also found a home in a machine called the SAM Coupé, which was manufactured and produced in the UK by MGT technologies (Bruce Gordon and Alan Miles, both ex-Sinclair staff also). It shared many interesting features with the Jaguar in terms of its video chip, but the machine sold very badly in Europe and the company folded." Of all of Sinclair's uncompleted projects, the Janus is by far the most mysterious. There is next to no public-domain information about the machine, although a mockup of it appears to have been produced (right). Its unusual looks, and particularly the lack of anything resembling a keyboard, suggest that it might have been a console of some kind. It may have been an attempt to use Loki-style technology to go head-to-head with Sega and Nintendo, as Flare subsequently attempted to do with the Atari Jaguar. The Roman god Janus, who lent his name to the project, was distinguished by his facing both ways at once - perhaps an allusion to the unusual vertical design of the case. If you have any information about this project, please get in touch! During the early 1980s, persistent rumours were heard that Sinclair was working on a portable computer with a built-in screen based on the flat screen technology which the company had spent 20 years developing. It was not just vapourware; Sinclair had put a considerable amount of money into developing a flat screen technology (eventually brought to the market in the TV80 pocket television) and he wanted to make use of this in computers as well as televisions. In 1980, a portable version of the ZX80 was announced. In May 1981, Sinclair amended this to a ZX81 with a "four or five inch flat screen". Very early prototypes of the Spectrum, designed in 1981-82, still exist with a mocked-up flat screen at the rear of the case. In 1983, the QL was initially envisaged as being a portable machine with space at the back for a row of batteries along the rear of the case. 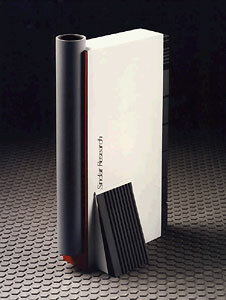 In 1985, a Spectrum-based laptop was announced, with launch envisaged for 1986. All of these projects depended on being able to use a scaled-up version of the Sinclair flat screen. The concept was of a holographic-style display, projecting the image in mid-air between the lid and the base of the machine. The name "Pandora", which was attached to the project as a whole, was a reference to this ingenious display technology - in the legend, when Pandora's box was opened it brought hope (and a whole lot else) into the world. Sir Clive had long detested liquid crystal displays (LCDs), disdaining to use them on his calculators even when cheaper and more power-efficient LCD calculators were sweeping the market. He made his views clear: "Liquid crystal is rubbish. Nobody pursuing that avenue is getting anywhere. Nobody in the world has an answer to the flat display problem - except us." His confidence proved misplaced, as the difficulties of adapting the flat screen technology proved insurmountable. Amstrad was unwilling to continue with the Pandora project and killed it after the 1986 takeover of Sinclair Research's computer business. However, Sinclair did manage to salvage the aims of the Pandora project in a rather different form - the Z88 laptop, which ironically uses a Japanese-produced LCD display.